There are countless PGR workshops designed to help PGRs expand their skills and to make the most of their time at the UofG over the course of their studies: opportunities to learn about writing for publications, discover handy tips and tricks for presenting at conferences…there’s even sometimes coffee and biscuits- it’s great! Choosing which workshops to attend is the easy part. The only thing standing between you and your development as a researcher is MyCampus. The name alone can strike fear into researchers and staff alike. One wrong click and you could accidentally drop your courses, cancel your tuition payments, or add the wrong photo for your student ID. Having spent the entirety of my academic career at the UofG, I’m one of the lucky few to have experienced the introduction and teething problems with MyCampus, and have lived to tell the tale. There are several helpful step-by-step guides to using various sections of MyCampus here, however, this post will focus on how to enrol on PGR development courses- and more importantly, how to survive the process. So you’ve chosen your workshop. You’ve made a note of the catalogue codes and you’ve logged in to MyCampus. The first step is to open up My Student Center, which can be found on the right of your screen under ‘MyCampus’. This will then open up a wonderful page which details whether you’ve registered for the academic year, your address, and exactly how much you owe in tuition fees. The less said about that the better. Click on ‘Enrolment’. You’ll then be taken to the Search for Classes page. These are the four main areas of the Researcher Development Framework set out by Vitae, and often found in various PGR documents provided by the University. You’ll become pretty familiar with each area, and the diagram reflecting them over the course of your research. You may also, like me, be unable to ignore the spelling of ‘Finance’ and fixate on it every time someone shows you the diagram. You’re welcome. The next few steps are also relatively simple. MyCampus will churn out several options for the workshop you’ve searched for, showing the dates, times and locations, as well as course availability. Scroll down, choose whichever one you’re after and hit Select. Note that some sessions will be very popular and may have a waiting list. You can find out a workshop’s availability by checking the Status icon- a green circle indicates that there are spaces available, a yellow triangle means that there’s a waiting list, and a blue square is for closed classes. Once you’ve selected your class, you’ll then be asked to confirm your selection. If you change your mind, hit Cancel, otherwise, press Next again. The course will be added to your class choices, but you won’t be enrolled yet, so don’t close MyCampus and have a celebratory HobNob just yet. Click on the My Choices tab at the top of your page. It will then show a list of the classes or workshops you’ve selected in the previous screens. Tick which courses in the list you want to select, and then hit the Enrol button. Congratulations- you’ve just successfully navigated MyCampus and enrolled into a PGR development workshop. 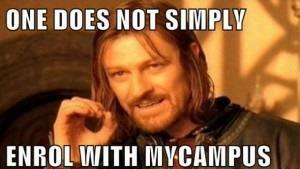 The good news is that you won’t really need to interact with MyCampus again, and can safely log out. However, your workshop will be added to your Timetable (under ‘My Timetable’ when you log in), so you can use this to check where and when your workshop will take place. Don’t forget to keep an eye on your inbox too in case of room or date changes, as well as details for future training opportunities. You can also find more information on the Researcher Development webpage. If you have any questions or suggestions, please get in touch via comments, Twitter, or email.